While the pasta is cooking, heat the olive oil in a large skillet over medium heat. Add the garlic; cook and stir until fragrant, about 1 minute. Add the shrimp, and cook until opaque, about 3 to 5 minutes. Pour in the tomatoes and heat through. Season with basil, salt and pepper. 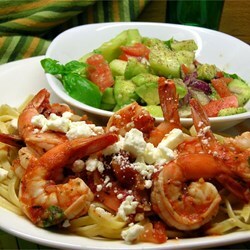 Toss the cooked pasta in the sauce, and sprinkle with crumbled feta to serve.